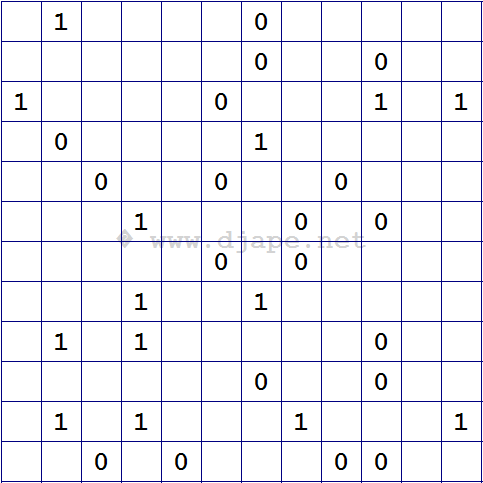 Here is another novelty: Binary Puzzles, also known as TAKUZU. 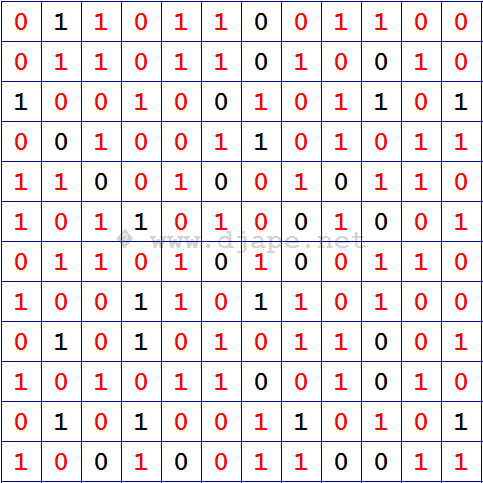 Binary Puzzles are played on square grids of any even size: 6×6, 8×8, 10×10 etc. Your goal is to fill the grids with 0s and 1s, following these simple rules: 1. There can be at most two 0s or at most two 1s next to each other, horizontally or vertically. So, 00 and 11 are ok, but 000 and 111 are not ok; also, 010 and 101 are totally fine. 2. There must be an equal number of 1s and 0s in each row and in each column. 3. Two columns cannot be completely the same. Neither can two rows be the same. And that’s all! Binary Takuzu Puzzle: 12×12 WARNING: DIFFICULT! From 1st rule we conclude that the first and second “?” must be 1. Also, from the same rule, the third “?” must be a 0. That’s easy. There are already five 1s in this row of 10 cells. Therefore, in order to abide by the 2nd rule, the remaining two spots must be filled with 0s! 1 0 0 1 0 0 ? Here, there are already four 0s filled in. There can be only one more 0 in this row! Can the “?” be “0”? No! Why? Because the three blank cells would all have to be 1 and since they are all adjacent, this would be against the 1st rule. Therefore, there must be a “1” in place of the “?”. Got it? Every time there is only one occurrence of a digit missing in a row, check where it can or cannot go! What do you think? This entry was posted in Free sample puzzles, Puzzle variants and tagged Binary Puzzle, Binary Puzzles, Binary Takuzu Puzzle, DIFFICULT, EASY, how to solve, rules, TAKUZU, WARNING. Bookmark the permalink. Post a comment or leave a trackback: Trackback URL. I really did enjoy this binary puzzle. New challenges, a new look at numbers, but doable. I can’t see any rule violation. Did I miss something?